Many thanks for posting these fascinating vintage slide images of prehistoric life. 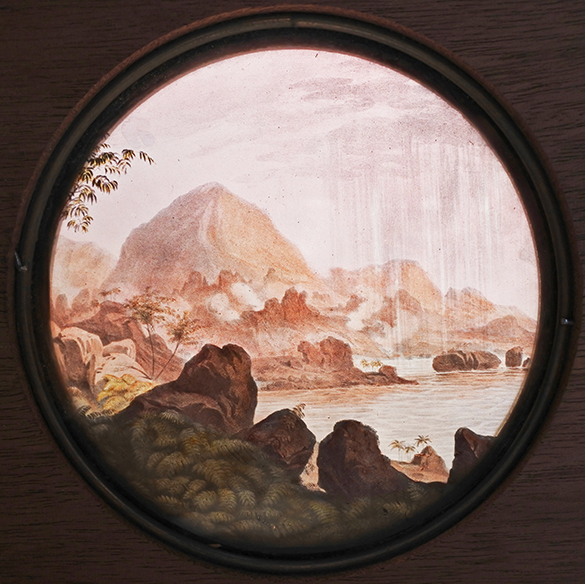 Note that some of these slides are based on illustrations originally from a German book from 1847 by the Austrian paleobotanist Franz Unger (1800-1870) and Austrian artist Josef Kuwasseg (1799-1859). There were later editions of the book and water color versions of the some of the plates. Some of these illustrations are discussed by Martin Rudwick (1995) and are considered to be the earliest attempts at scientific depiction of prehistoric life. 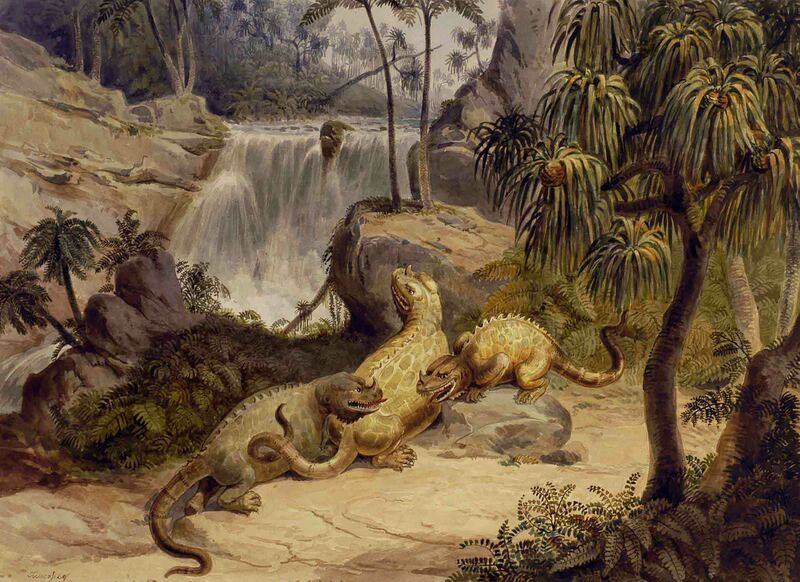 Scenes from Deep Time: Early Pictorial Representations of the Prehistoric World. University of Chicago Press, Dec 15, 1995. Some of the text of Rudwick’s book explaining the plates can be previewed in Google Books without the illustrations. Go to Chapter Four, pages 102-114. The Transition Period was an early term for the time period now corresponding to the Cambrian through the Devonian, which was thought to have few animal fossils (later revised because of discoveries in Britain). The plants are meant to be very primitive in the illustration. This it the first plate in the series in the book. The reptile by the sea is a Nothosaurus from the Triassic Muschelkalk in Germany. Thank you VERY much, Ben. You’ve added great value to these posts. 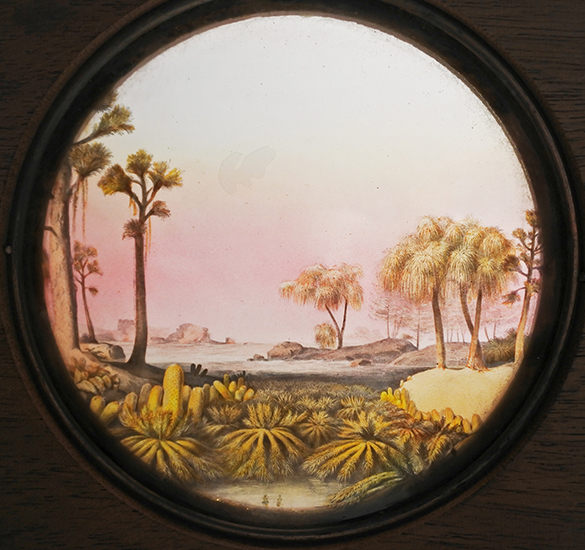 The Devonian landscape was not included in the original 1847 edition of the book with 14 plates. 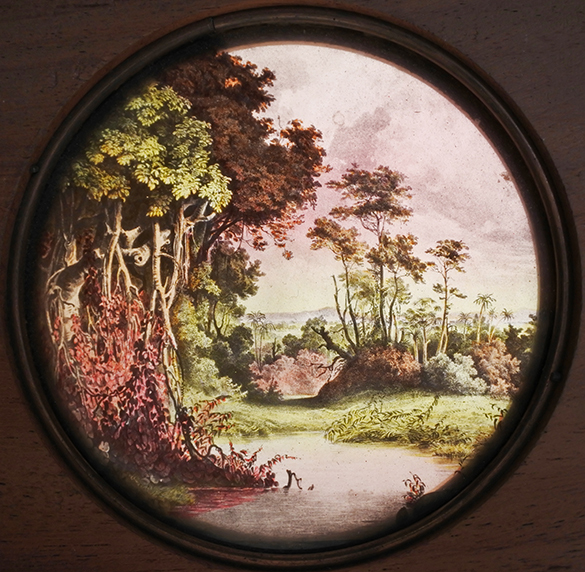 The Transition Period lithograph was apparently based in part on Devonian plant fossils. The 1858 edition had 16 plates but I have been unable to find an online version of that edition. This 1859 review in German of the revised 1858 edition of Unger’s book indicates that two plates were added for the Silurian Period and the Devonian Period (the source of the lantern slide) before the Transition Period plate, now relabeled the Later Transition Period. 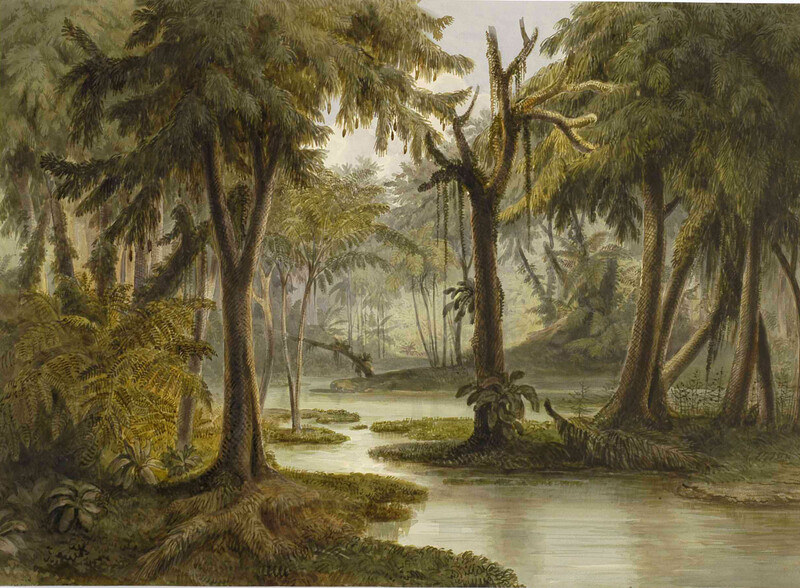 Illustration of Devonian landscape by Franz Unger. Thanks again, Ben. I corrected those typos in your first comment. Fascinating material! More great value added. Just for the record, some additional information and links. 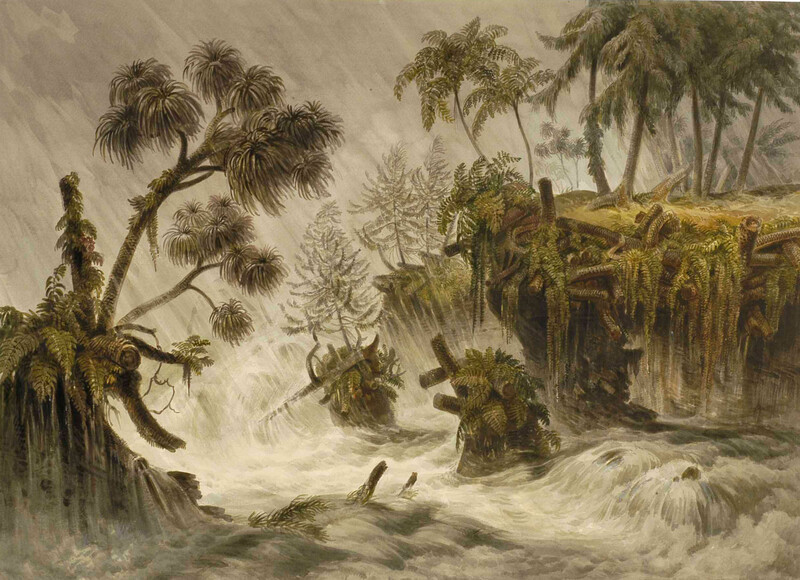 As explained in this post from 2015 by the University of Vienna about Unger’s book, Josef Kuwasseg originally created images of the prehistoric landscapes. These were then turned into lithographs by Leopold Rottmann (1812-1881) for Unger’s 1847 book. Additional images were created for the 1858 edition for the Silurian and Devonian. 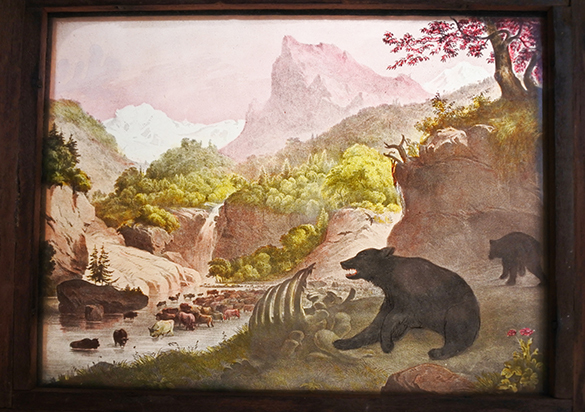 The watercolor versions include as well two images not used, one for the Carboniferous and one for the “Older Diluvium” showing rhinoceroses. 1858 edition text. Unfortunately, the 1858 volume of the actual plates is not available online it appears (I’ll keep looking). Here are links to images of some of the watercolors by Kuwasseg that may have been used to create some of the lithographs. Can be downloaded. In addition, the Pleistocene and Miocene water colors can be seen at this link. Click to expand (can be downloaded). Remarkable research, Ben! This is now a post for the ages. Thanks for so much great detail on Unger’s Primitive World. I was introduced to the work back in the early 1980’s at a University of Rochester Rare Book Sale. I was only 23 or 24 and had my future wife (and Accountant) with me. Two old ladies / book dealers had the full set of the 2nd ed. of plates in a cloudy old plastic bag (why few people noticed) at their booth. The were asking $35 for the set. I talked them down to $25 which I still feel bad about. The dirty looks I got from the book seller are frozen in my memory. 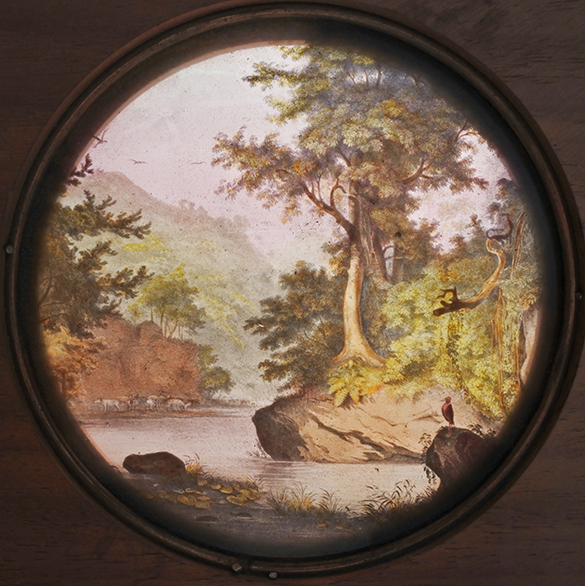 Your lantern slides are likely from the 1860’s 0r ’70’s. It was the later editions that were colorized. The Silurian plate acted as the surrogate front cover of my set so it is in extra-poor condition. This one and the Devonian plate (plus the ones I framed) are at: https://flic.kr/s/aHskQLuy3d (if it links properly). Since I want to be as accurate as possible, I’ve done a bit more research from additional sources concerning the watercolors by Kuwasseg (posted with links) and whether they were used, at least in part, in developing the published lithographs. The materials that still exist include preliminary drawings by Kuwasseg, the lithographs themselves, and two series of 18 larger undated watercolor paintings by Kuwasseg depicting the same images. Apparently there is some question about when the watercolor versions of the scenes were actually created and what relationship they have to the lithographs. The original 1847 versions of the lithographs (actually published in 1851 as it turns out) most likely were based on drawings by Kuwasseg rather than any of the watercolors in the links. 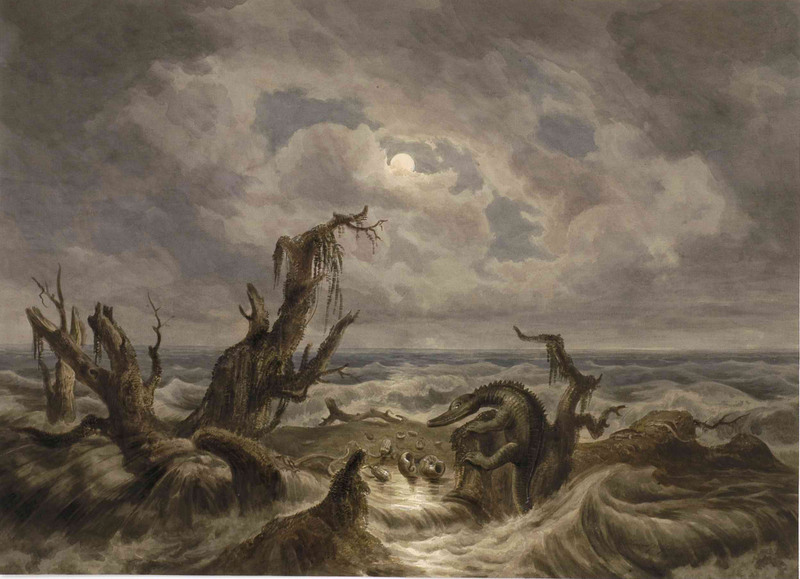 The watercolors may have been created in the 1850s and possibly were used for the lithographs in the revised edition of 1858. However, it is also possible that the watercolor versions were created as separate, special deluxe versions. The historical records don’t make the details clear it appears. B. Hubmann & B. Moser (2006): „Biedermeierliche“ Rekonstruktionen geologischer Ökosysteme durch Joseph Kuwasseg und Franz Unger.- Berichte der Geologischen Bundesanstalt, 69: 32-34. In any case, it’s interesting to compare the watercolor versions with the lithograph versions, and with the lantern slide versions. 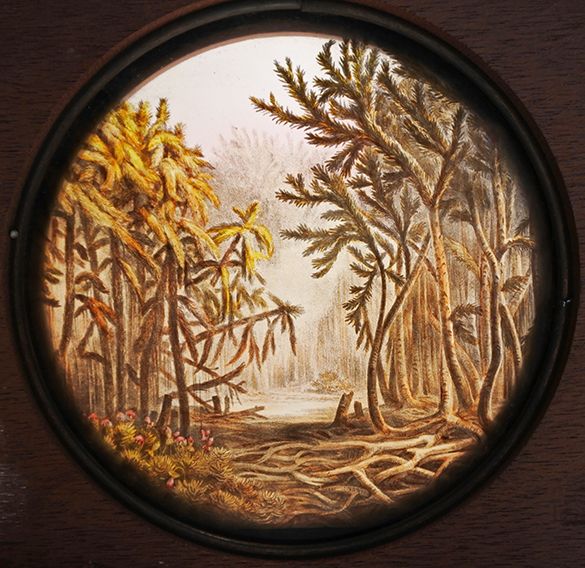 As a side note, the mysterious low bushlike plants depicted in the Transition Period slide, identified as Stigmaria in the text volume to the lithographs, are in fact based on the fossil root systems of tree-like lycopod plants from Carboniferous and were not a kind of exposed bushy skirt on a living plant as depicted by Kuwasseg under Unger’s direction. 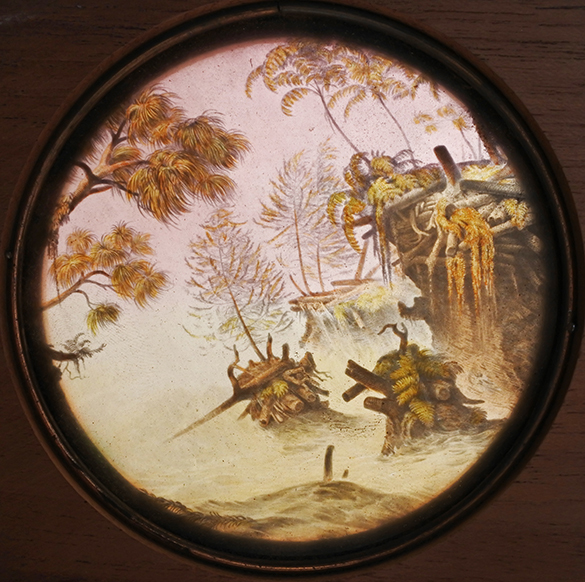 Here is a link to the 1887 T. H. McAllister Catalogue that lists the magic lantern slide sets available. There are earlier editions of the catalogue, so it’s not clear when the sets were first created. 1. Plesiosaurus, Teleosaurus, Ichthyosaurus, Pentacrinites, Ammonites, Gryphaea. 4. Anoplotherium Commune, Anoplotherium Gracile, Palaeotherium. 6. Elephas Primigeneous, Hyaena Spelaea, Hippotamus Major, Ursus Spelaeus, Machairodus Latidens. Both sets also appear in an 1877 catalogue from another company, so they date back at least to the 1870s. Amazing, Ben. You should write all this up as an article! A really excellent series of postings on these interesting pictures. Many thanks to all involved.